Whether you are a mobile professional, an executive or many other roles, Blackberry is with you everywhere for you can browse internet, be entertained with the multimedia features, etc. all keeping you stay connected to every aspect of your life. Even though BlackBerry has played consumer orientation an increasing role in its features, it still has one thing failing to suit your needs: if you want to show off some vacation videos to your friends or need some video entertainment with Blackberry on the fly, this gadget may sometimes throw you into a dilemma due to format incompatibility. This is because it only allows playback of video in particular formats like MP4, AVI, WMV, etc, but for other popular formats like FLV or MOV, BlackBerry seems to give no response at all. In this case, converting video to Blackberry compatible format seems to be your top priority. You may wonder how to transfer videos you like to BlackBerry phone? Don't worry all you need is a professional video converter for BlackBerry. Here MacX Free Mobile Video Converter comes handy to encode videos to your BlackBerry for free, which simplifies your predicament faced in dealing with incompatible videos on your phone. It's worth mentioning that this video processing software offers you an unprecedented high quality and smooth conversion experience, thanks to its built-in High Quality Engine and De-interlacing scanner, making video to BlackBerry conversion happen in a few minutes. 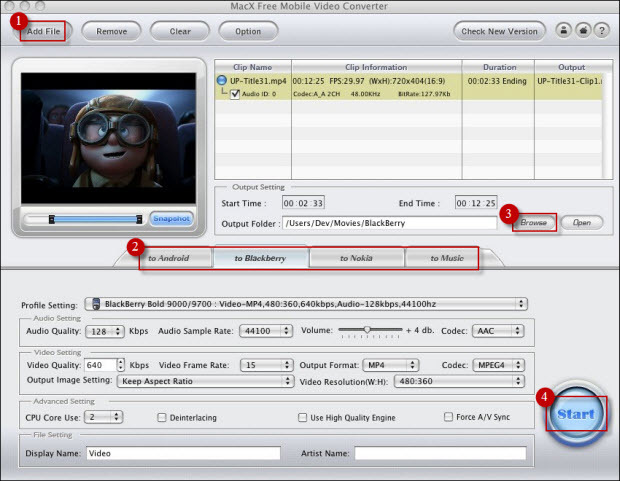 After free download and run the free video to Blackberry converter, click "Add File" to import the video files or directly drag the videos to it. Select "to BlackBerry" button as your output video format. The video/audio settings will be adjusted automatically according to the chosen device preset. Or you can also set your own parameters as you need. Once input and output file are selected, press "RUN" button to start transcoding video to BlackBerry. Then you can enjoy the videos you like on your BlackBerry anytime anywhere. You can also apply this utility to convert video to Android, to Nokia, to MP3, etc. With this freeware, you can take your BlackBerry with you every minute and anywhere to enjoy your favorite videos in the most vivid way. For those who would like to decode to more output formats, MacX Video Converter Pro would give a hand by providing more output formats like MOV, MP4, MKV, HEVC, H264, iPhone Xs/X/8/7/6s/6/Plus, iPad, Android, etc.